Wicked Circus is the third and newest title in Yggdrasil Gaming’s distinctive Jokerizer series of games and certainly offers a couple of little twists on its own! 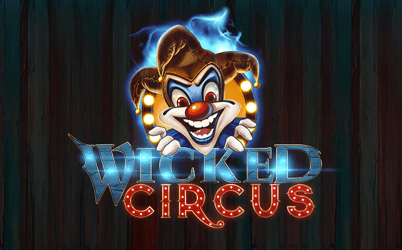 Play Wicked Circus For Free! Wicked Circus is the third and newest title in Yggdrasil Gaming’s distinctive Jokerizer series of games. It’s been designed with a similar theme, layout and features to the previous two titles. The game will be familiar to anyone who’s played the other games in the series, Jokerizer and The Dark Joker Rizes. 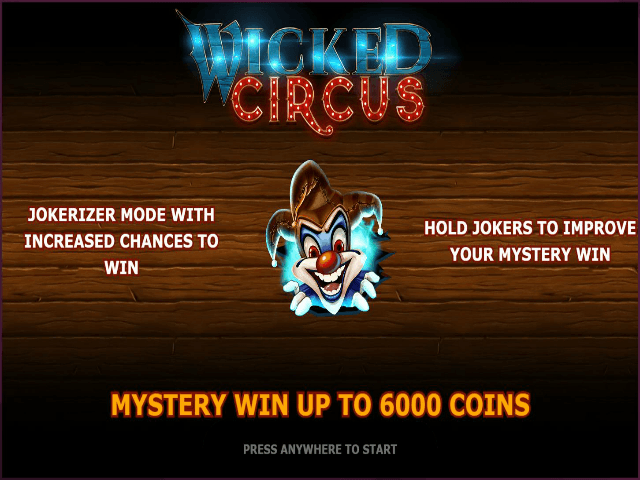 There’s the same Jokerizer mode and Mystery Win feature, and the same jackpot of 6,000 coins, but Wicked Circus does offer a couple of little twists of its own. Released in October 2016, Wicked Circus follows on from the popular Jokerizer and The Dark Joker Rizes titles from the same software developer. It features the same layout of five reels, three rows and 10 paylines as the other Jokerizer titles, with a minimum bet of 10p and a maximum of £20. It also offers the Autoplay and Max Bet functions that players are used to now, with the ability to set an infinite number of automatic spins. There are six regular symbols in Wicked Circus, which’ll be familiar to anyone who’s played the other Jokerizer games, although they’re designed slightly differently. Again, the star is the highest-paying regular symbol, paying out 300 coins for landing five on a payline, while the number 7 pays out 200 coins. The Joker symbol is at the heart of everything in the Jokerizer games, as you would expect. During the base game, landing three or more of them anywhere on the reels presents you with a Mystery Win. The payouts are slightly lower than the other titles, with three Jokers paying out 500-1,000 coins, four paying out 800-3,000 and five giving you between 2,000 coins and the jackpot of 6,000. Any win during the base game activates Jokerizer mode, where players can increase their winnings and their chances of victory. All winnings go into the Jokerizer balance which you can either collect or spend 20 coins to spin. Landing two Joker symbols during Jokerizer mode pays out a Mystery Win of 40-400 coins, but the feature ends when you receive a payout of 500 coins or more. The first two features are the same in all of these games but Wicked Circus offers its own unique third feature, namely the Hold function. After landing two or more Jokers during Jokerizer mode, you can either collect the Mystery Win or activate Hold. This will lock the reels which contain the Jokers but respin the other reels, giving you the chance to grab an ever bigger win. Hold spins cost 60 coins and you can continue to make them until you land five Joker symbols. The payouts aren’t as big as the other two Jokerizer games and you don’t get the random free-spin feature that’s present in The Dark Joker Rizes, but the Hold function is a nice addition. This is no ordinary circus but it could have you doing cartwheels when those Jokers land.